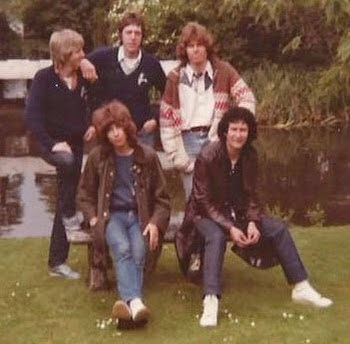 Chris Bradford formed The Heroes in 1979, with himself and Mark Hankins on guitar and vocals. The line-up was completed by Pete Lennon (lead guitar), Dave Powell (drums) and ex-Palomino band-member Brian (Wally) Wallis on bass guitar. Although primarily a recording group, they performed a tour of Germany with Dr. Feelgood, playing the Olympianhalle in Munich and the notorious Top Ten Club in Hamburg. Read some more about this on the Feelin Good page. The band's debut album ‘Border Raiders’ was released in 1980 along with singles Some Kind of Women b/w 10 % Will Do, and Wild Eyes. When Heroes signed with Polydor they gave the band shedloads of time at their Studio, along with various house engineers and the lads were pretty much left to their own devices ! These were "Glory Demos" really to ensure they knew what they were doing when they got working with Pip Williams at Chipping Norton and Phonogram studios. It saved wasting expensive recording time dicking around, so they produced these songs themselves with the aid of talented, enthusiastic engineers. Here are three of the recordings. That same year Mike Mansfield shot videos for Some Kind Of Women and Wild Eyes but Heroes manager, David Walker wasn't happy with the results and ordered both songs to be reshot at Shepperton Studios. At the time The Sweet were shooting Sixties Man at the same studio, which fortuitously brought Chris and Andy Scott together for the first time. Heroes and crew in a 3 am playback at Chipping Norton studios during recording for Border Raiders. Chris, Pete Lennon, John Eden (engineer - Pip's right hand man through Quo, Heroes etc. ), and Pip Williams. Exhausting, exacting work - but what a result!! Mark Hankins and tour manager Simon Renshaw on the Heroes German tour, waiting in the Lobby. This could be Berlin, Munich, who knows… check the state of these guys !! Mark and Chris have been lifelong friends - been through a lot together ! Will he manage to get to breakfast? 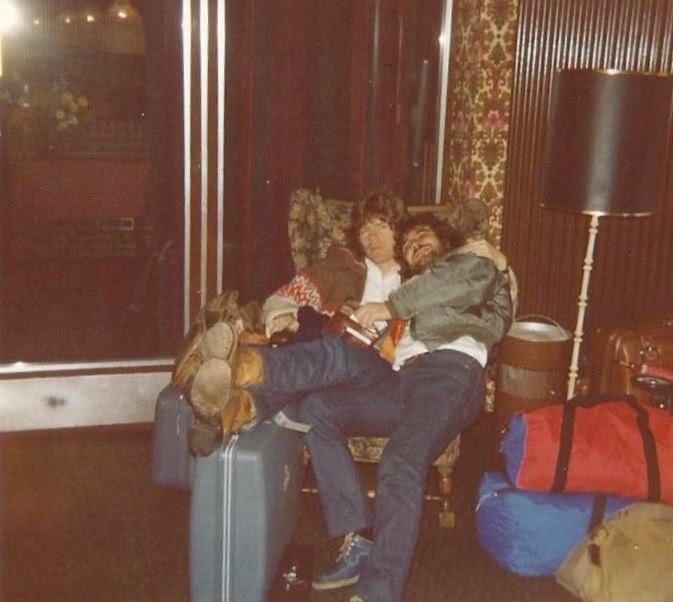 Chris and Pete getting Renshaw to breakfast - Hamburg. Simon Renshaw survived the tour, and went on to manage ZZ Top, Sweet and is now the long time manager of The Dixie Chicks. The second Heroes album "Reasons For Reverse" was recorded, and mastered but remains unreleased at this time. These songs are available as a full album on BANDCAMP. Bandcamp also has the following single: the live recording of Yeah! The Circles was also a dead cert for Reasons For Reverse. It and Brandy Loops can be heard here, and are available for download as singles on Bandcamp.